NEW! Join in on our Forum on Types of Meditation. Do you have a great story or advice? It's a way to open discussions or ask questions, all on your own page! Click here to go to the bottom of the page for the Forums! There are lots of different types of meditation, but these different methods all lead to the same place, the stillness that holds the infinity and vastness of all Creative Energy in the universe which we tap into when we quiet the chatter of the mind. Trying a few different types with good meditation instructions will eventually bring you to the right meditation practice. Time your meditations to last 30 minutes, twice a day, if possible. However, any time you can devote to your meditation practice will bring positive results. Always sit upright, either in a cross-legged position on the floor, or in a comfortable chair (experienced yoga practitioners may want to sit in half or full-lotus). The spine should be erect and straight. Lying down would allow the body to become too relaxed and you would easily fall asleep. Lie down only if incapable of sitting in an upright position. Don't judge the outcome or the experience. Lots of thoughts are just part of the purging of extra stress, which is a good thing. In between the thoughts, there is silence. That silence is the creative, fertile ground for everything and anything to become manifest. That space is timeless and eternal Spirit. Accessing this timelessness will produce profound results in your life, and the abundance that is in the unmanifest will become manifest into your physical existence. Close your eyes and take a deep breath in through the nose. Feel the air travel into the nostrils and feel it travel down into the lungs. Allow the exhale to escape naturally. Don't force the breath in any way and just feel the natural inhale and exhale. As you feel the natural flow of the breath, you will begin to have thoughts. When a thought arises, acknowledge the fact that you are having a thought, and then let it go as you gently bring your awareness back to the breath. Repeat this process, staying aware of the breath. If thoughts arise, as they will, let them go as you bring your awareness back to the breath. Chakra meditation is a type of concentrative meditation which is a fundamental of Kundalini Yoga. Kundalini is the Divine Cosmic Energy in the body. It is symbolized as a sleeping serpent, coiled-up at the base of the spine. This energy lies dormant until awakened, then flows up the spine to the brain through the Sushumna Nadi, a channel through which nervous energy passes, energizing the various chakras along the way. 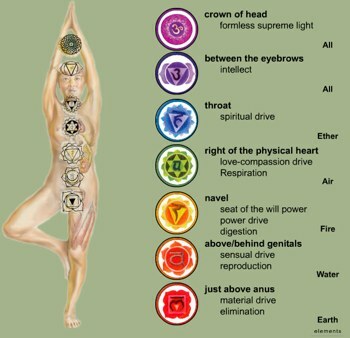 Chakras (there are seven main ones) are subtle energy centers going from the base of the spine upward to the crown of the head, and are like fly-wheels corresponding to different areas of the nervous system in the body. Chakras are seen as whirling vortexes that are concentrations of energy that connect mind and body to Divinity. Chakra meditation involves imagining the colors and locations of the chakras (rainbow colors), and repeating mantras for the cleansing and balancing of each one, such as these chakra balancing affirmations found at Healing-Journeys-Energy.com, a site filled with information on health, abundance and well being. Mantra meditation involves the use of a mantra (mantra means "mind-instrument"). This meditation technique brings one into unity consciousness through repetition of a sound vibration, and establishes a state of transcendence. The use of a repetitive sound begins to allow the thought process to slow down, opening the heart and mind, and brings one into higher levels of consciousness. This is a powerful meditation technique and a deeply spiritual and sacred practice for many meditators, but you do not need to be a "religious" person to experience the gifts of mantra meditation. It is a powerful, ancient practice that affects the chemistry of the body and mind, and its vibrations can invoke tremendous healing responses physically, mentally and spiritually. This form of meditation can be practiced by anyone seeking spiritual vibrations for success, health and peace, and is an important part of the process of self-realization. This is the ultimate goal of yoga: the realization that we are spirit in essence. Like other basic concentration exercises, it can be used simply to still the mind or it can be the basis for deepening your awareness and Oneness with the Highest Cosmic Consciousness. Mantras are often chosen for you by an experienced master or guru, but you can use any word, phrase or sound, as long as it does not bring the mind into a state of constant thinking about its meaning for you on a personal level (for instance, using the word "love" would keep the mind focused on a beloved, past, present or future.) For that reason, a mantra that you choose for yourself should not have a meaning that would keep you from transcending the thought process. A good mantra is OM. Om is the most sacred, universal sound vibration and is always an excellent and very effective mantra to use. Using a mantra is a spiritual practice that has a place in almost all religious traditions, although the methods of practice may differ. "Mantra Yoga" and "Nada Yoga" are the "yogas of sound". The great Rishis, seers and saints of ancient India passed down sacred sound vibrations for all life forms, and especially for human life to obtain spiritual realization. To practice Mantra Meditation, simply sit quietly in an area free from distraction. Begin by inhaling deeply and exhaling, feeling all stress release through the exhalation. Silently and slowly repeat your mantra, over and over. When thoughts arise, as they will to a greater or lesser degree, simply acknowledge that you are having a thought, and then gently bring yourself back to repeating your mantra. When through with any of the different types of meditation, gently bring your awareness back to your surroundings and sit quietly for a few moments to allow the absorption of the practice into your physiology.